A hotel is a business offering temporary lodging to a traveler. Today hotels are also a place to hold conferences, weddings and many events. A hotel’s popularity is based on its ability to offer good choices of hotel rooms, and good services in their entertaining department. A smart hotel interior decorator usually uses subtle Feng Shui symbols to create a harmonious setting that makes the guest comfortable. 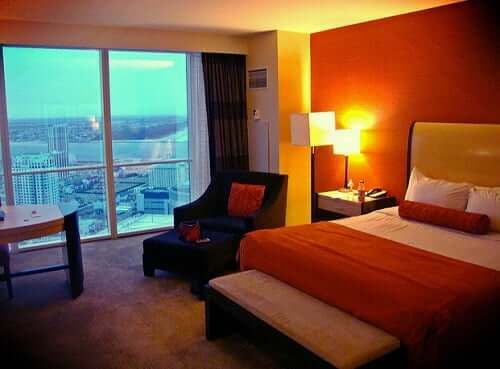 A hotel with good Feng Shui would have a showcase of a good balance of the four elements in every hotel room. As hotel have rooms facing all directions, decorators have to make adjustments when required. With limited space, the experienced Feng Shui decorator or consultant would use colors or shapes to symbolize the five elements. Sometimes drawings when the walls allow it. A skilled person can subtle create a balance within small space confines. Red fabrics or warm colored pictures. Having triangle shapes as wall decoration or chevron pattern on curtains or frames will be excellent. Green or wooden items, or representation such as art that depicts plants. A rectangle represents the wood element, symbolizing change and growth. Shades of earth, or clay pots in the room. Square shapes to symbolize the earth, and it helps balance the overall chi in the room. Silver, gold or any metallic color represents metal element. For patterns, look for round or circular shapes, and usually not placed near the resting corner: it invites energy to create. Blue or wavy pattern. Usually the bed is dark blue to represent the calmness of the water element, suitable for resting. As chi enters from the door, the bed is visible, but not so that the occupant’s legs are pointing at the door. The flow of chi should be sideways, and the headboard is made from firm material to represent good support. A good hotel room has lots of natural light streaming into the room. Mirrors are at strategic locations to bring in more light, but does not reflect harsh light in the morning to wake up occupant. For travelers, aside from noticing minor details in your hotel room, you can further improve the energy of it. A small kit containing Feng Shui essentials is easy to carry around and use when required. The main component of the kit is a small compass, which will help you determine location of your luck sectors. The first thing to do when booking for a hotel room is to ask for one that has a pleasant view. If that is not possible, the room should be away from elevators, noisy traffic or construction work. Noise and clutter are bad Feng Shui and should be avoided, because a good night’s sleep is good for you. For frequent flyers, candles and incense can be a nuisance to bring. Consider treating yourself with small bouquets of fresh flowers, they smell good and they are of wood element. They do not cost a lot and are easy to dispose of when you are leaving. If you are too lazy to keep fresh flowers, then a plastic version can do just as well. A portable Zen garden is more of an Earthly element, and comes in small box with sand for you to draw upon and meditate. Place the garden near the sunny side of the room. Charms like bottle gourd or Wu Lou can be placed next to your bed for good health. A small five element pagoda for those who practice Flying Star Feng Shui to help lessen the affliction star’s power. Small pendants as jewelry can help with work luck, such as mystic knot necklace. A jade pendant with a symbol of dragon for protection, suitable for family trips as dragons are powerful beings. You can take a family photo with a dragon background, to hit two birds with one stone. That photo can travel with you, keeping you safe and making you feel at home. Many Feng Shui consultants recommend a round faceted crystal to reflect light and positive energy into the room. Crystals are of earth element, and if you are looking for wealth luck, get them in green. You can get crystals in the color of the element that will help you, be careful not to upset the overall balance of the room. A red packet or a red piece of ribbon to give a kick of fire element, or to improve good luck in some areas. In Chinese culture, red packets are a must as it is good luck to give and receive, and it is a ‘preferred’ gift in many practices. Boil a kettle of water after letting the pipes run for a minute, this is to generate live water energy for positive flow. Starting the kettle helps with starting the fire element, and this helps kickstart the flow of Feng Shui energy going. Always keep the bathroom door closed, and do keep an eye out on the direction of the toilet.This is to stop your wealth luck from being flushed down the toilet. A room with a good view or facing a garden gives you perfect opportunity to crack the window open and let some fresh air in, this is for beneficial movement of chi. If there is a mirror facing the bed, use a towel to cover it up while you are sleeping. Or if the mirror is movable, use it to reflect the toilet away from the bed. If not, find one big enough to do the job, or cover the toilet when it is not used to minimize the harm. Working travelers usually have their laptop, fill your playlist with nature’s song or peaceful music to let the positive energy fill the air. Also have the laptop in your wealth or work sector, so that you can have better results at work. A compass will be helpful to find your wealth corner, or use the general area and set it up in the far left corner of the room, diagonally across from the door. Remember to sit with your back against the wall, this symbolizes firm support. Even if you are staying for a night, unpacking moves chi around. You do not have to unpack a whole suitcase, but just enough to make you feel at home, this can prompt some rest time. Unpacking can also help you take stock of what you need to replace in the trip, and is a good habit to have. Even if for a night, the hassle of unpacking is worth the good energy it generates. A good traveler knows the importance of good energy flow, good Feng Shui relaxes and helps you rest and unwind. The good flow also helps improve your concentration at work, and improves the luck you need when doing business. Good energy can affect you mentally and spiritually, this reflects on your outlook, allowing you to feel more confident. It might sound hard to remember the habits and keeping a Feng Shui kit as first, as you travel more it will become second nature. Over time you will find which method works well, and find new ways to enhance your trip.